Looking to create a website but don't know how to start? This completely free website setup guide can help you get a website online in less than an hour - even if you're a complete beginner. Why is This Guide Perfect for Beginners? Our guide is designed for beginners and we have made it very easy for anybody to create a website - even if you're not a techie! This guide is updated daily based on user feedback to make sure it isn't outdated and is up to date on best practices for websites. Even if you've never setup a website before and are a complete beginner, you can have a site online within an hour. Guaranteed! We think our guide is the easiest way for beginners to setup a website, but if you do get stuck, we're available to help! Just send us a quick message through our contact form and we'll work with you to get your site online - for free! The first thing you need to decide when starting a website is what site building software you're going to use, if any. Most beginners have two main choices when it comes to creating a website. If you want to build your website from scratch, you'll need to understand HTML code, which has a big learning curve and isn't suitable for beginners. The other option is to use website building software, also known as a Content Management System (CMS). Which Website Software Is Best? Using a Content Management system is a very easy and powerful way to build a website. Using a CMS, anybody can build a site with little or no web or HTML code skills. There are many different platforms available to choose from, but the absolute best CMS to use when building your website is WordPress. Nearly 25% of all websites online are powered by the WordPress software. WordPress is an incredibly easy way to build an amazing website and powers some of the biggest sites on the web, including TechCrunch, The New Yorker, ESPN, Fortune, The New York Times and many more. WordPress is open source, and is completely free to download and use. It has a very low learning curve, which makes it perfect for beginners. 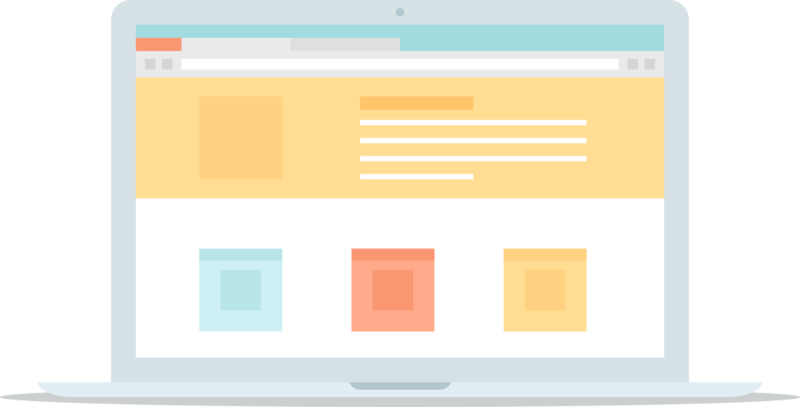 You can build any kind of site, from a blog to a full-blown online store. There are hundreds of stylish WordPress themes that look good on mobile too. There is a large WordPress community and lots of tutorials to help you if you get stuck. WordPress can usually be installed with one-click and no tech skills are needed. There is nothing to install or set up right now. WordPress can be installed with just a few clicks once you have somewhere to install it. First, you'll need to choose a domain name so people can visit your website. Keep reading for some tips on how to choose a great domain for your site. Before you can create a website, you'll need to choose a domain name that will display your site and you will also need a web hosting account. The hosting account is where you will install the free WordPress software and for beginners you'll be looking to pay no more than $3-4 per month. Having your own domain is much more professional than a free website that often look like yoursite.freewebservice.com. Not only that, but hosting your own site is much faster and won't have any advertising on it (which many free website providers put on automatically). We recommend using BlueHost.com to host your site and register your domain name. Right now there is a special offer on for Site Beginner users which is just $2.95 per month and includes a free domain name too. BlueHost host well over 2 million websites and WordPress can be installed in just a couple of clicks, making your website setup very easy. Keep the domain easy to type for added brand and marketing value. Try to use simple words, not too long, that are spelt how they sound. You want the name to be simple and easy and roll off the tongue so that when your friends and family talk about it they will remember the domain. Stick to .com, .net or .org domain extensions. There are lots available, but most people won't understand or remember your .awesome name! It's tempting to add hyphens and go for Your-Company-Name.com but it's hard to explain and doesn't look good for branding! In this final step you'll learn how to install WordPress on your web host and set up your website. Hosting check! Do you have your web hosting account and domain name all set up? If not, head to Bluehost.com now to get that set up so that you can follow the guide below. Once you've got your hosting account and domain, the next step is to install WordPress. There are two ways to do this and one of them is much easier for beginners. Head to your main "control panel"
Click "Install Now" and watch as your site is magically created for you! Need help? Click the button below to watch a video showing exactly how to install WordPress from the Bluehost control panel. In rare cases, you might choose a web hosting company that doesn't have a one-click installation for WordPress. In that case, you would need to download the WordPress software yourself, set up a web database and install all of the files yourself! Avoid web hosts that do not offer a one-click installation of WordPress unless you have advanced skills and know what you are doing! There are thousands of themes you can use for WordPress to make your site look amazing and you can customize each of them to make it even more unique! From the Themes page, click Add New Theme and you can search for themes based on features like the color, layout, and popularity and with such a large selection there are some great themes to choose from. In our follow-up series, we'll cover themes in more detail and show you which one we use for Site Beginner too. Once you find a theme that you like, choose Preview to see how your site might look using that theme, or click Install to add it to your site, and then Activate to make it your theme. After you have a great theme installed and activated. You're ready to start adding content to your site. Below we will cover some of the basics for adding content, pages and menus to your site. Click any of the buttons below to view the step-by-step setup for each of the options. Need a visual guide? Take a look at the animation below to see exactly how a Page is created in WordPress. Watch a Post being created! Take a look at the animation below to see exactly how a Post is created in WordPress. Need help? Take a look at the animation below to see exactly how to create a navigation menu in WordPress. Need help? 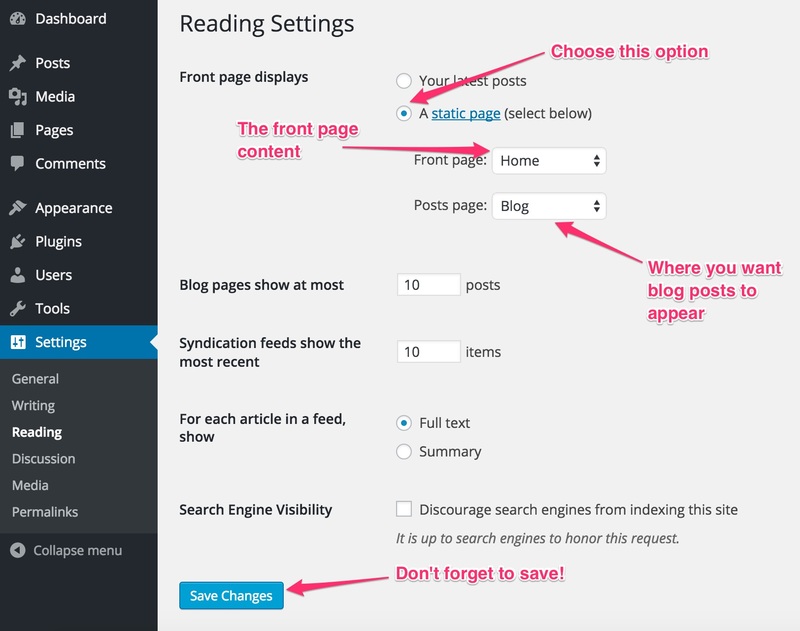 The image below shows exactly how to set a static front page in WordPress. Below are some frequently asked questions to customize your WordPress even further. How Do I Remove Comments From Posts/Pages? How Can I Set The Site Title and Tagline? The title of your site is shown at the top of the page and often this would be your business name, or your personal name if you're starting a blog. What's a Sidebar and How Do I Add Content to It? You can add content to your sidebar really easily by going to Appearance → Widgets from your Dashboard. Widgets are small pieces of content that you can drag and drop into your sidebar to easily customize your site. We'll cover widgets in more detail as part of our follow-up series. Your Website is Now Ready to Launch! Hopefully, you've found this guide to be very useful and easy to follow along with. Below, you'll find some options on what you can do next to continue your learning and improve your newly created website! If you followed this guide all the way to the end, you should now have a very strong foundation and a fully-functional website. But there is so much more you can do! Our free email follow-up series will teach you how to customize your site further, and will cover things like which theme we recommend and how to add an email newsletter to your site, as well as introducing plugins - small applications you can install to WordPress to add things like a contact form, an online store and many more! To get started, enter your name and email address below and you'll receive tutorials every week that will help you to improve your website. Your details are never shared or sold, and we hate spam as much as you do, so we'll never do it. If you found any of the sections in this guide difficult, or have a question about setting up your website that we didn't cover then please contact us with your questions and we'll be happy to help!